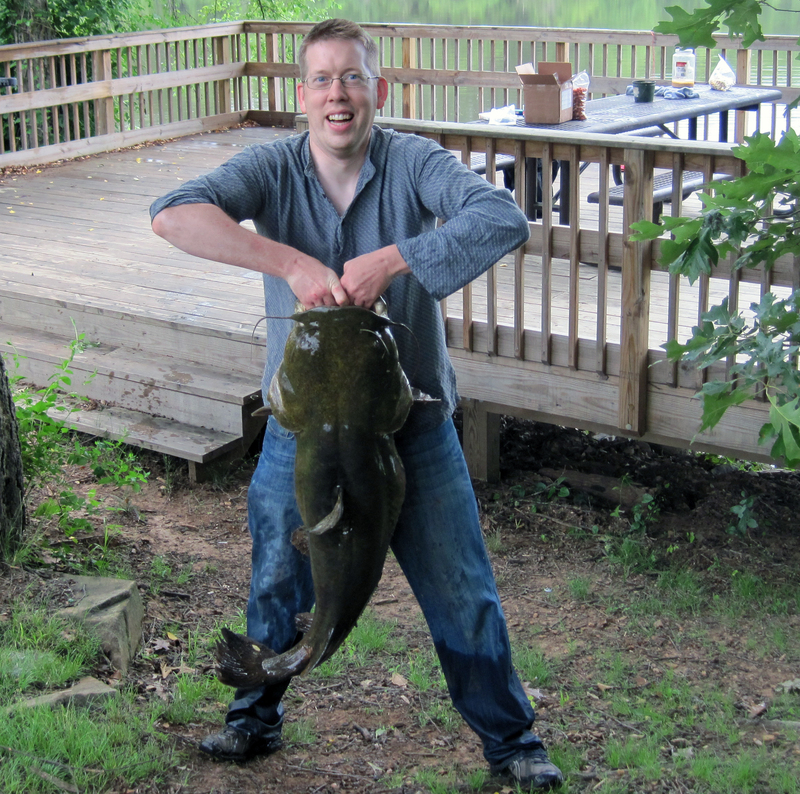 There is something awesome and primitive about flathead catfish. Flatheads are apex predators. They are aggressive and they get massive. The world record flathead catfish was 98 lbs 8 oz from Lake Palestine in Texas. 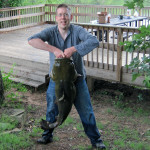 Flathead catfish do not have fork tails. Flathead catfish have a protruding lower jaw. Flathead catfish are brownish yellow and have a protruding lower jaws. The easiest way to tell small flatheads apart from channel catfish is that flathead catfish do not have a forked tail while channel cats do. 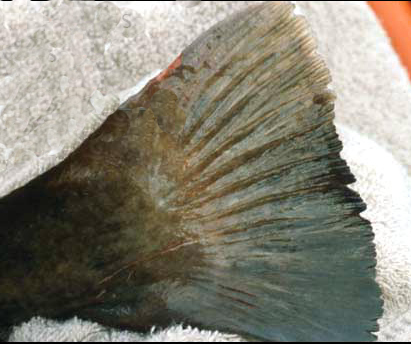 Bull heads are the only other catfish in North America without a forked tail but bullheads rarely get much bigger than a few pounds and bullheads do not have the protruding lower jaw. Flathead catfish are not fans of cold water. Flatheads do best in the warm waters of the south. Consequently, in places that have flathead catfish and cold winters, the flathead fishing becomes more difficult in the winter time as the flathead catfishs’ metabolisms slow way down. A 53 lb flathead that I caught 6 feet from shore in the early morning. More so than other catfish, flathead catfish are aggressive predators. Fishing for large flatheads is more like for bass at times. Flatheads spend the day time hunkered down close to struck often in extremely shallow water. Look for flatheads along holes, under cuts and submerged logs along the shore. At night time the flathead catfish tend to leave their structure and prowl along the shoreline. Night fishing from shore is very popular with flathead fisherman because you can set up rods and wait for a roving flathead to grab your bait. 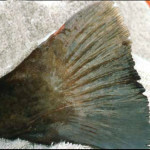 However, day time fishing for flatheads from a boat can be more productive because flathead’s day time locations are more predictable and a mobile fisherman can go from one flathead hide-out to the next very quickly. Hands down the best flathead bait is live fish. Live blue gill, live sucker, live bull heads, live goldfish, live shad, live skip jack or even live carp. The best practice is catch your bait locally. Local bait not only mimics a flatheads actual food source but it reduces the chance of you accidentally introducing strange species or diseases into your favorite fishing hole. 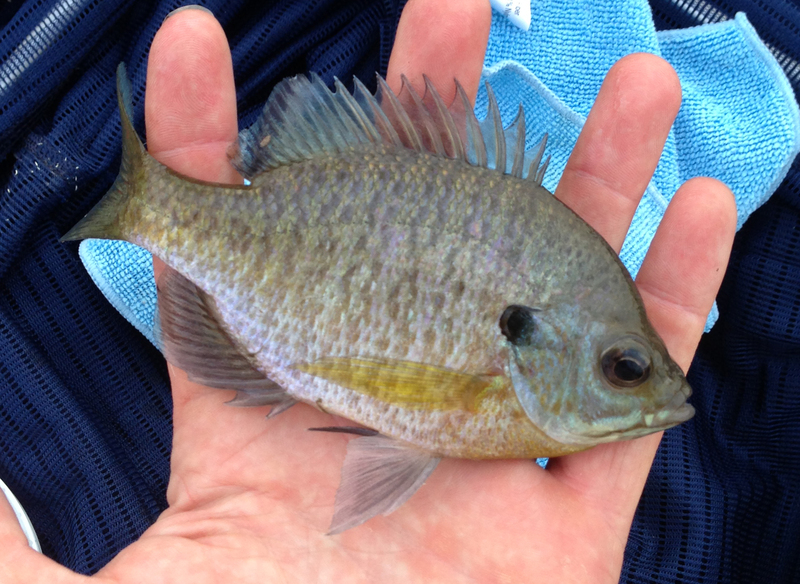 A live hand sized blue gill is the classic flathead catfish bait. 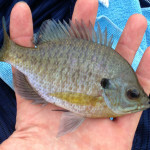 Blue gill are popular flathead bait partly because they are so common. Bull heads are bigger and tend to catch huge flatheads. Bullheads are also extremely tough. A bullhead will stay lively on your hook even after catching a big flathead catfish or two. Gold fish are also popular flathead baits. You can buy a bunch of them cheap at most pet stores and their bright colors act as a powerful lure in murky waters. However the gold that may escape off your hook can reproduce in the wild, fishing with them may also violate some laws so be careful. While live bait is by far the most popular bait for flathead, you can often catch flatheads on lures and jigs as well. Cut bait, stink bait and more traditional catfish bait can also put flatheads on the bank so always keep an open mind. I have even caught flatheads on fruit flavored pop up boilies.